At the heart of Maine Maritime Academy’s tug and barge operations program, the Tug Pentagoet provides students with unique hands-on opportunities. In addition to tug and barge operations, the Academy offers semester-long courses in ship handling and workboat operations. During the course of a semester, students work aboard on the waters of Penobscot Bay to learn and practice the art of hawser towing, towing alongside, and a wide range of close-quarters boat handling skills. 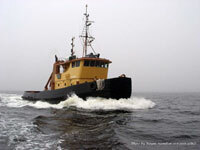 The Academy acquired the Pentagoet, formerly the Tug Jekyll Isle, in 1984, and since that time has partnered the tug with a variety of barges. 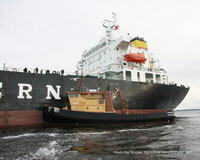 Recently K-Sea Transportation generously donated the barge Oyster Bay. Working with this 230-foot notched barge, our students are exposed to all aspects of this growing sector of the marine industry.